A typical class starts with an energized warm-up focused on building agility, flexibility, and conditioning while practicing Brazilian Jiu- Jitsu body movements. The kids then drill Brazilian Jiu-Jitsu techniques, with a partner that does not resist until each student is comfortable with the move. Next, the kids practice their techniques while grappling with each other in a fun, safe (“tap out”), training environment. This type of repetition develops muscle memory, physical speed and mental adaptability, three elements needed in the duress of an attack. Many of the combative skills and drills are interwoven in games and play so that the kids have fun while developing the attributes they need. Gracie/Brazilian Jiu-Jitsu is often referred to as “The Gentle Art” because it is a martial art system that emphasizes position and leverage to neutralize, subdue, and if necessary disable an aggressor. This approach allows a person to effectively defend themselves with out the need to inflict excessive damage to their opponent. Brazilian Jiu-Jitsu fosters personal development through physical education, personal achievement and ethical growth. This performance based martial art emphasizes the principle of “Minimum effort for maximum efficiency,” a method of utilizing strength through gentleness. It is an expression exemplifying both the mental and physical aspects of Jiu-Jitsu. Continual focus on personal development leaves students respectful of others, exhibiting humility when winning and graciousness in loss. Strengthening this mind-body connection enables a person to better contribute to society and the world. Students are asked to verbalize and demonstrate their new skills with their fellow practitioners, increasing their personal responsibility. The importance of maintaining conduct towards personal growth is heavily stressed both in and out of the Academy. As kids achieve their individual goals and develop new skills, their confidence grows. The beauty of learning self-defense athletically is that kids can see their own strengths and weaknesses through fun and safe competition. The literal meaning of “Competition” is (Comp=together & Petition= towards growth) together towards growth. We like to use the term “Healthy Competition”, or striving together. We strive together to accomplish Jiu-Jitsu techniques that are defined by mutual growth and development through student interaction. Kids will gain self-esteem and exhibit confidence with their new-found Brazilian Jiu-Jitsu techniques. We find that the individual character of each child shines brighter as they gain confidence in their own abilities. In the last 10 to 20 years, because of the efforts of the GRACIE family in what are called “Mixed Martial Arts” competitions; one form of Martial Art has emerged above all others as the single most effective means of self-defense among ALL forms of self-defense. That art is called “GRACIE/BRAZILIAN Jiu-Jitsu.” Brazilian Jiu-Jitsu is the ideal method of self defense for kids since it emphasizes leverage and technique over strength and power. This focus makes it possible for all children to excel, regardless of their size or athletic ability. This is a martial art that eliminates the need to use excessive force, even in a personal safety situation, by using grappling techniques to subdue the opponent. Nobody has to get hurt with Jiu-Jitsu. The idea of “tapping out” during training allows the students to keep their training realistic, yet safe. Brazilian Jiu-Jitsu teaches kids to avoid trouble whenever possible, think instead of panic and improvise instinctively. Kids have fun while learning to focus their minds on their bodies. Brazilian Jiu-Jitsu satisfies the energetic needs of kids by weaving technical skills and drills with games and play. Enhancing this mind – body connection promotes focused learning which develops better attention spans, self-discipline and personal responsibility both in and out of the academy. Brazilian Jiu-Jitsu challenges the entire body, developing coordination, balance, agility and poise. It is specific in its requirement of body and mind to work as one. Kids in Jiu-Jitsu learn gross and fine motor movement, developing fast and slow twitch muscle. BJJ improves reaction time, breathing control and effective self-defense while providing a complete body work out. These movement patterns are inherent to life and any sport they might choose down the road. Building leadership, recognizing the individual, commitment to excellence, positive reinforcement & earned reward. 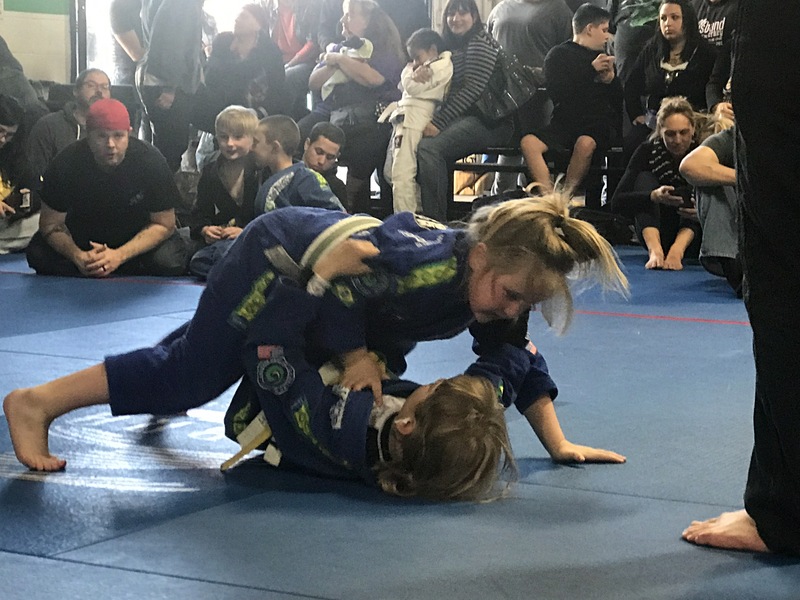 Let the Charles Gracie Brazilian Jiu-Jitsu Academy of Truckee/Tahoe share their experience with your children to learn strength of character, self- confidence, realistic personal safety techniques, and good sportsmanship through Jiu-Jitsu’s fun activities. Parents will notice a change in their children’s confidence, increased physical coordination, and concentration in all life situations. Early exposure to Brazilian Jiu-Jitsu is truly a great gift for your child!